Tweak says, "It's not lying if they make yo"
Below is information about the "Bellatrix/Rodolphus shipping community" asylum on InsaneJournal. To join this asylum, click here. You may leave the asylum at any time. This is the IJ shipping community for the Harry Potter fandom's 'ship 'Bellatrix Black-Lestrange/Rodolphus Lestrange'. 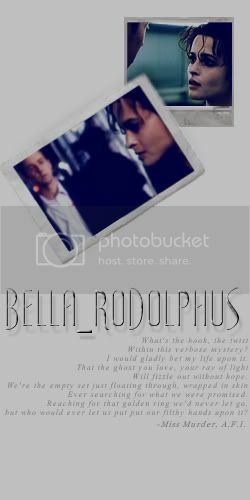 Fan art, fan ficton, graphics, icons, discussion and all sorts of Bella/Rodolphus stuff are more then welcome here. This community is the IJ version of the community on LJ, which was originally opened on the 28th of January 2005 by sionnain and kaz814. On the 6th of May 2006 it was handed over to nashira(aniraangel on lj) and laura_isaac. As with all good things, this community must have rules. 1. All posts should have the Bellatrix/Rodolphus ship included. If you don't enjoy the ship, no flaming--because really, why would you be here? 2. Please make sure to place all questionable material under an LJ-cut. If you are under the legal age for viewing adult material, please do not join the community. By joining, you acknowledge that you are of a legal age to view such material. The community mods are not responsible for minors who disregard this rule. 4. Please place all large photos, long text, and such things under an LJ-cut. The LJ-Cut is our friend. We *loves* it. 5. Due to the nature of the pairing there is likely to be some dark fics found here--and this is fine! In fact, it's encouraged! Please remember to post appropriate warnings with your fics. 6. Authors/artists LOVE feedback! So if you see something you like, leave a comment. 7. Finally, please make an effort to have your fic beta-read. No one is perfect but the mods reserve the right to delete posts that have exceedingly poor grammar/spelling. Posts are sorted by tags.